If you're planning on surpassing 14 or so psi of boost, then yeah. Otherwise, it's hardly more expensive, if at all, to get a 3 bar instead of a 2 bar sensor. 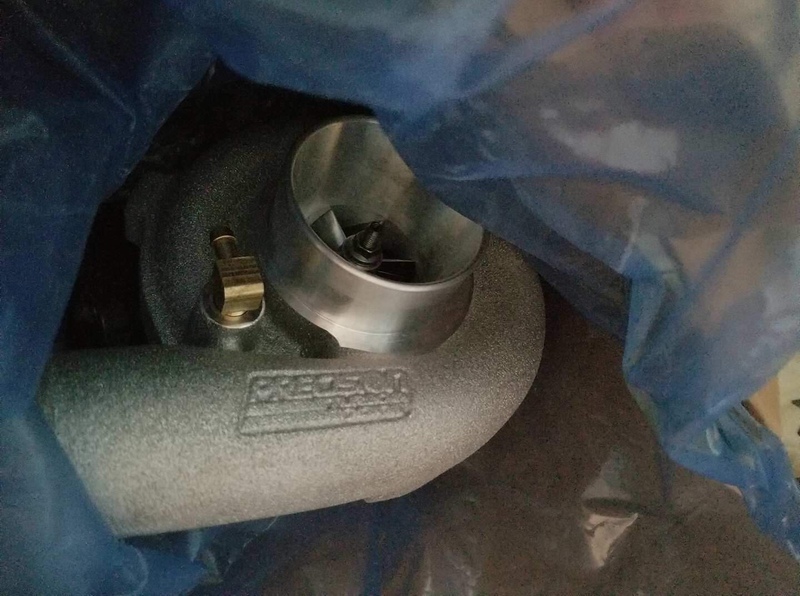 Probably won’t run more than 10psi for the meantime, thanks! Keep in mind, you still need to get at least a 2 bar sensor if you're boosted. Though I'd REALLY recommend just getting a 3 or 4 bar to be done with it. Just to clarify... I have ran ~18PSI on stock injectors on 91 octane on a 2871 with a 3" exhaust. (Different kit but it should give you an idea). I want to say i was at 95% duty cycle on the stock injectors. IIRC the car did have an aftermarket pump. But for pump gas you do NOT need to swap your injectors. And there are absolutely no benefits. There are downsides such as having incorrect low pulse width calibration of your after market injectors giving poor transition into port injection mode. Always swap the least parts possible... If you are not planning on running E85 there is no reason to go further. Also 300 WHP on 91 octane can be done but its really pushing the envelope of 91 octane IMO. 93 makes it easier. My personal kit could do it with my large turbine and a free flowing exhaust. But I also have a massive intercooler and my IAT temps are barely above ambient. Also this heavily depends on the type of dyno you are using. On a dyno jet sure you could probably still hover around there with a GTX30R and a 3" catless exhaust. My car is an early 2013. Bought it used with 10k miles, currently has 72k without seeing a dealership. As far as I know, it is the original ecu version. (I've had low idle dip forever and the DRLs flicker below a certain rpm). Would it be wise to bring my car into the dealer for them to flash the ecu to the latest revision before committing to a F/I kit while it is essentially (motor wise) 100% stock? Or would an EcuTek tune do that for me when it gets tuned? Depends when your planning to boost. If it’s really soon then I wouldn’t see any point in taking it into the dealer and flashing it twice. Whoever your tuner is will tweak everything out for you. Anyone with dyno sheets care to share what kind of power you're making and mods with the kit? After 4 years and 72k miles, it's happening. Ordered my JDL kit on Friday and paid today. I am beyond excited and can't wait to put everything together .. too bad the winter is coming up. Oh well; gives me time to get the kit together without rushing. ended up going with the gtx2867r, no-cut intercooler, 2.5" recirc wg, oil pan, bronze thermal coating, catted/res front pipe/over pipe combo, mxp comp RS exhaust and a south bend daily clutch with Exedy flywheel (oem). The guys over at 86Speed seriously hooked it up .. give them a call. Getting some baseline GTX2860R Gen2 numbers on a Mustang Dyno. 304whp / 255wtq on just the 9.4psi spring and E67 in the tank. Pretty much what I expected! This turbo isn't even trying. EBCS and more boost soon! Last edited by ATL BRZ; 11-15-2017 at 11:14 AM. JDL EL Turbo Kit with GTX3071 .82 Tial housing (medium sized). Turbine has slight damage on the exhaust blades. JDL fabricated intercooler (i think it was like a 700WHP core, not the standard intercooler). The thick line was iirc ~14PSI. The one below i dont remember and i only plotted it to show that i was in fact revving up. IIRC i went to 7800RPM but i lost grip on both pulls. The thick line i lost tracking much earlier so I don't know what power it would have made. Probably 400-425HP range. Mind you this is also not a dialed in tune. My fuel trims were not ideal and my closed loop fueling in boost was aggressive to compensate for my laziness. The dashed line is a factory car with factory tune. 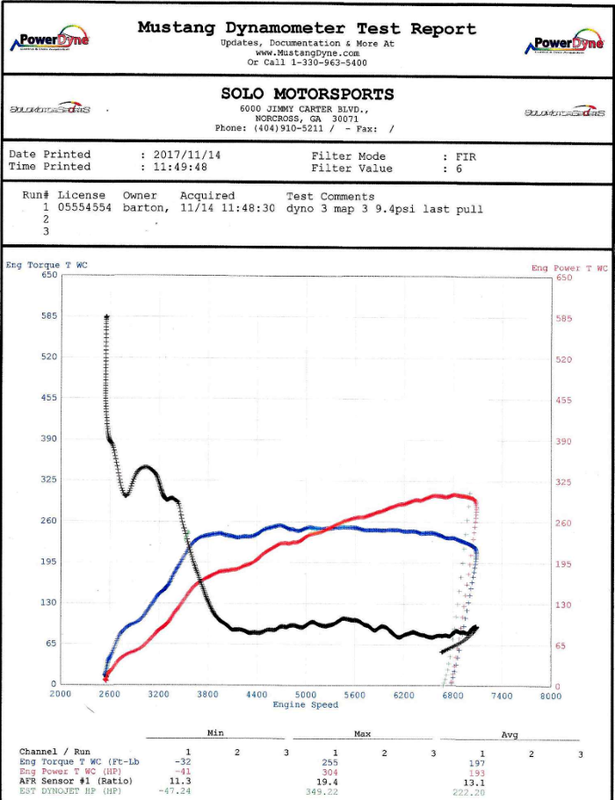 Baseline on this dyno for 6MT is typically 130-135HP. Of all the kits I have tuned I would have to say the JDL has been one of, if not the most power I have made per PSI. Mine however is not a standard kit so your mileage may vary. Last edited by nelsmar; 12-13-2017 at 01:22 PM.